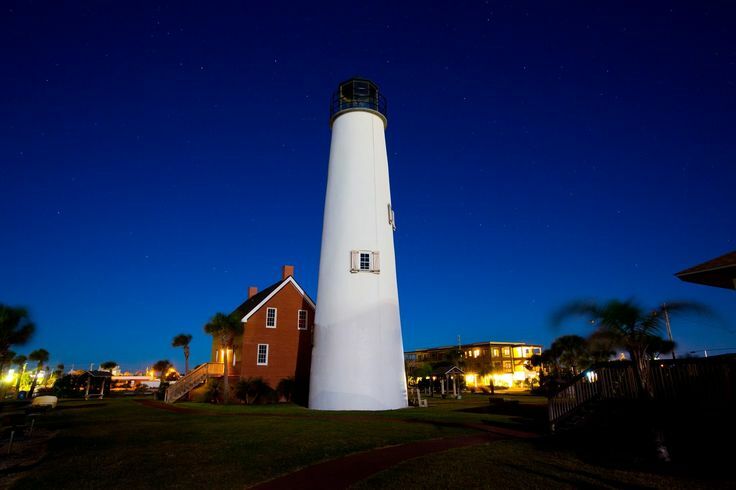 The 77-foot Cape St. George Lighthouse now stands proudly in the center of St. George Island. Built in 1852, the lighthouse stood on Cape St. George or "Little St. George" and guided ships through the dangerously shallow waters for over 150 years. On October 21, 2005, the lighthouse fell. A dedicated group of volunteers reclaimed the original pieces and rebuilt it where it stands today. The Lighthouse Keepers Cottage includes a museum with exhibits that tell about the history of the lighthouse, the keepers and their families, and the maritime culture of the area. A gift shop is also located in the Keepers Cottage.Call (850) 927-7745 for information. Open on Monday, Tuesday, Wednesday, Friday, and Saturday from (10 a.m. to 5 during the season and noon-5pm in the winter); and Sunday from 12 noon to 5 p.m., closed on Thursday.